The announcement Friday that the National Park Service will begin installing markers at places of importance to the history of lesbian, gay, bisexual and transgender Americans is a step toward including them in the national narrative — and components of education, supporters said. 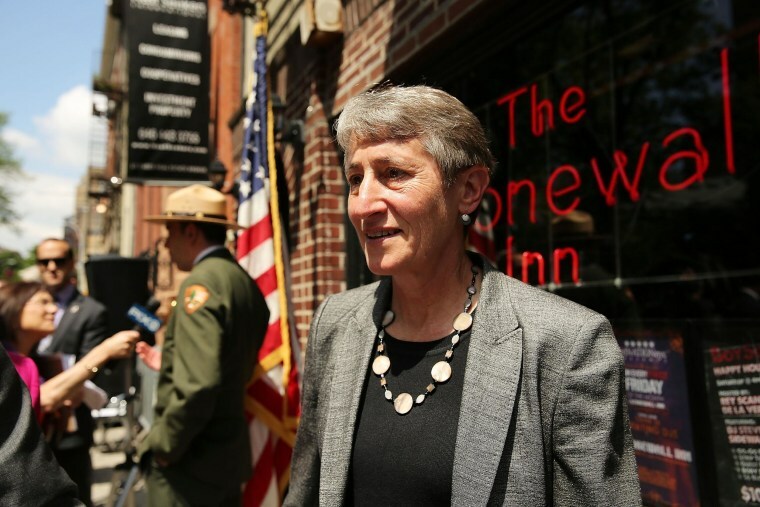 Interior Secretary Sally Jewell made the announcement Friday at the Stonewall Inn, the scene of riots in June 1969 that are widely credited with starting the modern gay rights movement. Stonewall was made a national historic landmark in 2000, and June is widely celebrated as LGBT Pride Month. Jewell said the nation is on a journey to expand civil rights to historically underrepresented groups. The process on LGBT issues mirrors efforts the service already has undertaken to preserve and promote locations that reflect the roles of Latinos, Asian-Americans and women in U.S. history. "Part of the job of the National Park Service is to tell this story," she said. The initiative comes after years of debate about how LGBT people fit into America's historical narrative and whether they should be included in textbooks. California state legislators passed a first-in-the-nation law in 2011 requiring public schools to teach students about the contributions of LGBT Americans in state and U.S. history. The law was supposed to take effect in January 2012, but because of budget cuts that have put state textbook funds on hold until 2015, few districts have begun to implement it. Meanwhile, eight states have laws on the books that ban schools from teaching anything positive about homosexuality, said Eliza Byard, executive director of the Gay, Lesbian and Straight Education Network. Arizona, for example, requires that no school district shall include curriculum material that "portrays homosexuality as a positive alternative life-style," while South Carolina says gay relationships can be discussed only "in the context of instruction concerning sexually transmitted diseases." Byard attended the news conference in front of the Stonewall, in Manhattan's Greenwich Village neighborhood, and praised the park service initiative. "Symbolically it's hugely important that now LGBT history is officially part of the national narrative," Byard said. "This is part of what our federal government will identify, preserve and single out."